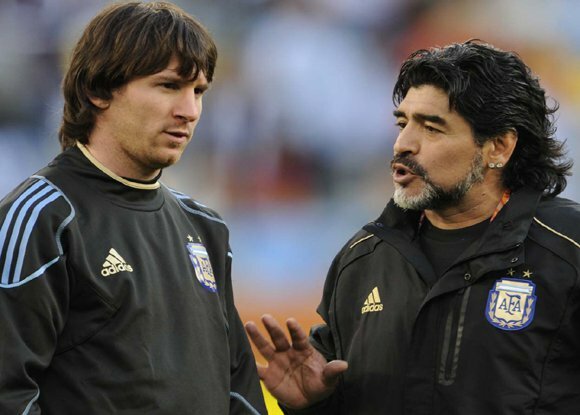 Argentina great Diego Maradona has told Fox Sports that Lionel Messi, who he coached at the 2010 World Cup, is not a leader and should not be considered a footballing god. Maradona, who along with Pele is widely considered to be one of the best players of all time, said Messi was one player at his club Barcelona and another with the national side. "We shouldn't deify Messi any longer," he told Fox Sports. "He's Messi when he plays for Barcelona. Messi is Messi when he wears that shirt, and he's another Messi with Argentina. "He's a great player but he's not a leader. It's useless trying to make a leader out of a man who goes to the toilet 20 times before a game." That comment was believed to refer to Messi's extreme nerves before games, which have seen him vomit ahead of some important matches. Messi, 31, has claimed every possible honour with Barcelona and has won the FIFA World Player of the Year award five times. But he has struggled to reproduce the same scintillating form when wearing the blue and white of Argentina. He has been on the losing side in all four of his finals with Argentina -- three in the Copa America and at the 2014 World Cup -- and has not scored in four World Cup knockout stages. After a disappointing World Cup in Russia, where Argentina failed to get past the last 16, Messi opted to take a sabbatical from international football. Maradona, speaking from the Mexican state of Sinaloa where he coaches local second-tier side Dorados, said Messi's break was sensible. "I wouldn't call him up right now, but never say never," he said. "We have to take the pressure off him." Argentina beat Iraq 4-0 on Thursday with a new-look side, taking their unbeaten run since Russia to three games.